The history between Santos and I dates back from our Citrus Grove Elementary days and stretches through Miami Senior High, a bizarre early morning post-McDuffie verdict drive through Downtown Miami after a night out, a mutual ‘come to Jesus’ moment on the receiving end of a pointed .22 caliber gun [either of us would have earned the distinction of being the 1st person shot during a discussion of Gilligan’s Island trivia], Catholic schooling our kids, and Duffy’s Tavern [not the chain dammit] discussions. I hope and trust we are all lucky enough to have at least one friend who could accurately be described as the ‘nicest person you could ever meet.’ The only negative I associate with Santos is that he has so many friends that many Miamians could answer that affirmatively and yet only be referring to one person. 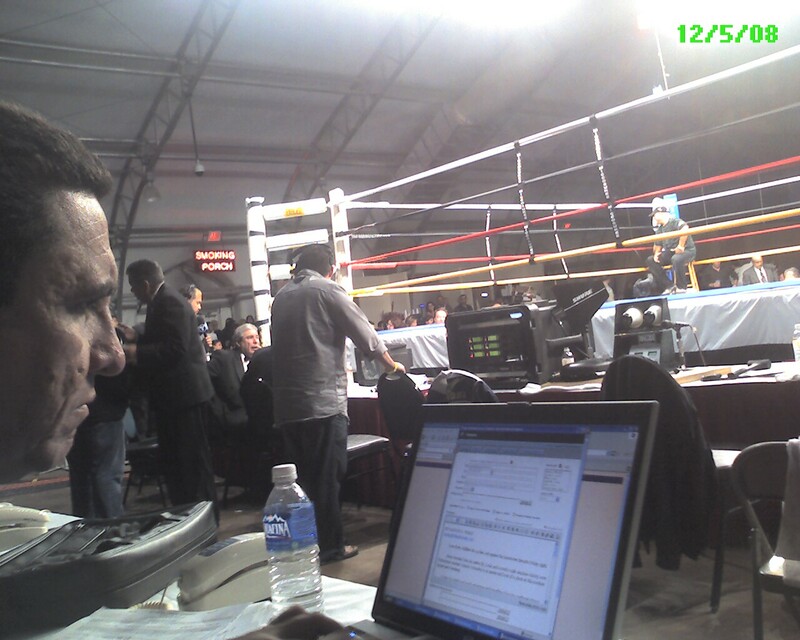 In the introduction to his characteristically humble induction speech [see below], fellow HOF’er Bob Alexander noted that “[Santos] sitting ringside with his laptop has virtually been a guarantee at any South Florida boxing show.” The photo to the right indicates that Bob is a reliable source. I took that picture on my Palm back in 2008 [as the incredibly useful date stamp¹ indicates]. I had pestered Santos enough to allow me to tag along not just to the actual boxing matches, but to the weekday promotion held at a local restaurant. It was great fun as I blogged about the press conference and then the actual boxing matches at Miccosukee. I made new friends with people I had much in common with, people like Jerry del Castillo and Jose [El Chamby] Campos who continue their work on the Spanish language sports scene. I met the promoter who was also inducted in the HOF with Santos, Tuto Zabal Jr. Hanging with Santos was like being granted an ‘he’s OK cloak,’ which means that I got to sit in on their wide-ranging and often hilarious discussions as though I was one of them. What more could an outsider ask more? Spreadsheets did not beckon that day. Gee I wonder whatever happened to that skinny red-headed Mexican kid? In his speech, Santos gave a special mention to one of his mentors. In the attached link, I copy his 2008 article in remembrance of Hank Kaplan. 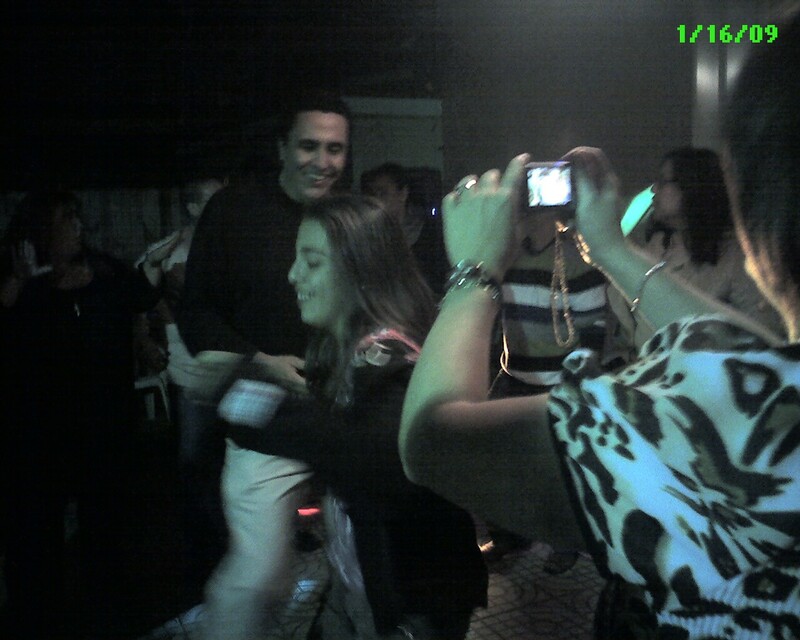 An oddly glorified mobster once noted, “A man who doesn’t spend time with his family can never be a real man.” In the picture above, I captured Nuria as she captured Santos trying to hang with their lovely daughter on his 50th birthday. Sadly, he couldn’t. But let’s be clear, it wasn’t because of the 50th thing, he couldn’t on his 40th, or 30th or…. ¹- it is incredible to me that the date stamp is not a basic feature offered with any smartphone camera on the market. Surrounded by many of the South Florida personalities he has written about for more than 30 years, Miami Herald boxing writer Santos A. Perez was inducted Sunday into the Florida Boxing Hall of Fame.“This is truly an honor,” said Santos, 55, during ceremonies at the Sheraton Tampa East hotel. “Boxing has been a love of mine long before I wrote my first sentence for publication.”Santos, who came to Miami from Cuba, grew to love the sport as a child, hearing stories from his father Jose. He has written for the Herald since 1995 and spent another 15 years before that writing on boxing for the Miami News and The Associated Press. He was at ringside in 1982 in the Orange Bowl for the historic bout between Alexis Arguello and Aaron Pryor, which is still considered perhaps the best fight ever held in Florida. Santos thanked both those who have helped him along in journalism and the colorful people he has enjoyed writing about in a career that has illustrated his passion for the sport. This entry was posted in 2TG Favorites, Sports and tagged Bob Alexander, Boxing, Gilligan's Island, Godfather Saga, Greg Auman, Hank Kaplan, Jerry del Castillo, Miami Senior High, Palm OS, Palm Pilot, Palm Pre, Palm Treo, Palm Tungsten, Palm Zire, Pepe Campos, Saúl [El Canelo] Álvarez, Santos Perez, Tuto Zabala Jr.. Bookmark the permalink.